The greatest run-scorer in the history of cricket, Sachin Tendulkar retired in 2013 after an astonishing 24 years at the top. The most celebrated Indian cricketer of all time, he received the Bharat Ratna - India's highest civilian honour - on the day of his retirement. Now Sachin Tendulkar tells his own remarkable story - from his first Test cap at the age of 16 to his 100th international century and the emotional final farewell that brought his country to a standstill. When a boisterous Mumbai youngster's excess energies were channelled into cricket, the result was record-breaking schoolboy batting exploits that launched the career of a cricketing phenomenon. Before long Sachin Tendulkar was the cornerstone of India's batting line-up, his every move watched by a cricket-mad nation's devoted followers. 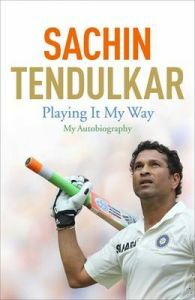 The book is in Sachin's own words as told to his co-writer Boria Majumdar who worked closely with Sachin. The Little Master in his own words !!! A personal account of his jouney from playing school cricket in Mumbai to being a cricketing phenomenon. Sachin writes about how he manages expectation every time go goes out to bat for the country. A story about how he became the highest run getter both in tests and one day internationals. An interesting account of India’s world cup victory. Also covers his failures and frustrations. Born in Mumbai, Sachin Tendulkar made his Test debut in Pakistan at the age of 16 in 1989. One of the most gifted and entertaining batsmen to have played international cricket, he scored more runs and made more centuries than any other player in history - in both Tests and ODIs. He made his first Test century at the age of 17, at the age of 36 he became the first player to make a one-day double century and in 2012 he scored his 100th international hundred. With India he won the World Cup in 2011 and reached the top of the world Test rankings in the same year. In 2013, he retired from cricket after playing his 200th and final Test in front of his home crowd in Mumbai. The book is Sachin's own words as told to his Co-writer Boria Majumdar who worked closely with Sachin.